On Saturday I decided to get out check some of the local flats to check of the waterfowl numbers and diversity. In the last few weeks there has been multiple reports of Tundra Swans (Cygnus columbianus) and there were other sightings involving Redheads (Aythya americana), Canvasbacks (Aythya valisineria), and Ruddy Ducks (Oxyura jamaicensis). This was motivation enough for me to see what I could turn up close to home. 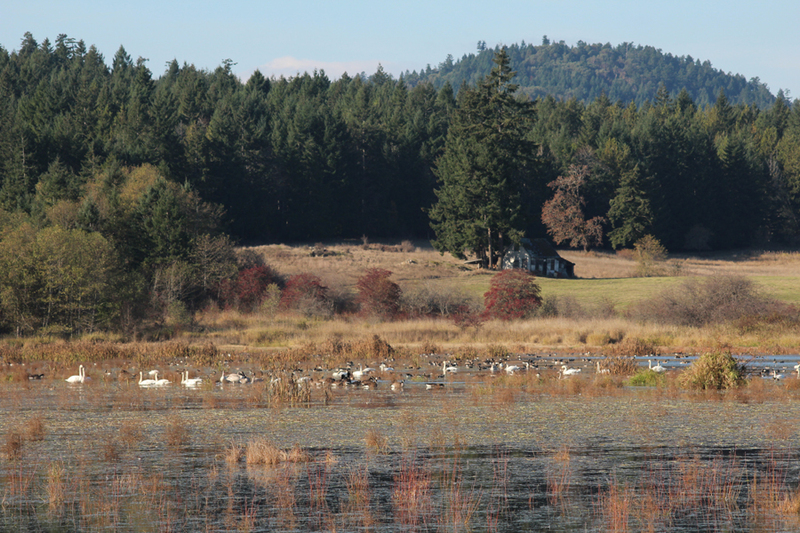 I started off at Tod Creek Flats behind the Red Barn Market on West Saanich Rd. As I came down the hill towards the Red Barn Market, I could see the number of large white dots on the water had gone up significantly in the last week. The bustle of waterfowl on Tod Creek Flats is accentuated by a picture perfect fall scene with loaded hawthorn shrubs, dead grasses, and turning leaves contrasting the evergreen wall of conifers. I was excited to get out and sort through those large white dots to see how many were Tundra Swans. The last Victoria checklist was produced in 2001 and it asserts that Tundra Swans as rare for this area, which means they are annual but typically limited to a few records. I think the timing of rainfall this fall has resulted in higher-than-average numbers in our area. The first report this fall came from Ian Cruickshank on October 23rd when he noted nine Tundras (4 adults, 5 juveniles) flying over the appropriately named Swan Lake. These birds landed on Viaduct Ducts where they were enjoyed by many Victoria birders. 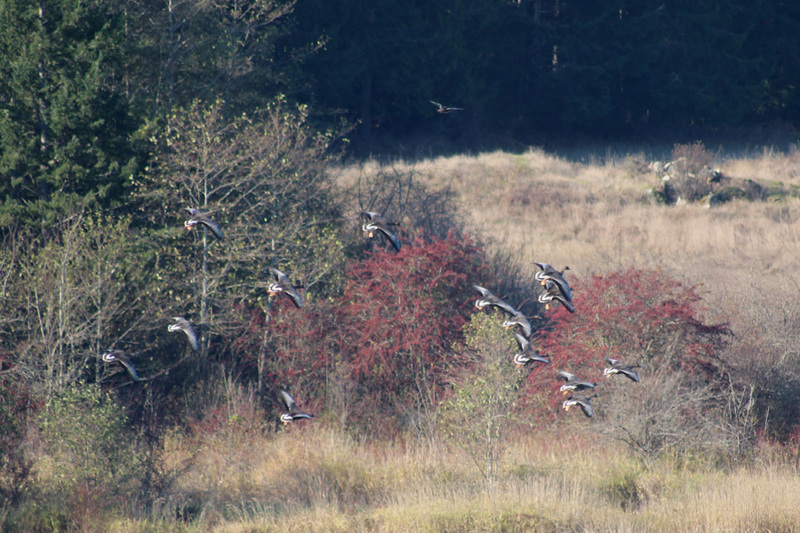 On October 31st, Mike McGrenere noted a flock of 17 adult Tundras passing west over Martindale Flats and the next day he found a group of nine resting on the fields at Martindale that likely constituted a different flock. Considering Mike is one of the most active birders in Victoria, this quote from BCVIBIRDS says it all: "I think this must be close to the number that I have seen in Victoria since I moved here in 1985." I don't get to study Tundra Swans very often, so that puts my excitement in perspective. I was not hoping to find a Tundra, I was expecting it! Spoiler alert! Yes I did see some Tundras! 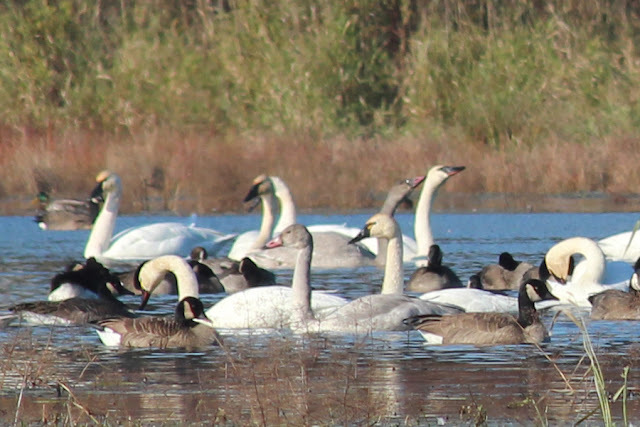 The front and centre cygnet and adult are Tundra Swans. Compare them to the back right cygnet and adult Trumpeter Swans (Cygnus buccinator). When adult Tundras have a yellow spot in front of their eye, they are much easier to identify as you can see here. The juvenile Tundra has a bill that is largely pink, including the base and sometimes extending into the lores. Almost immediately I spied my first Tundra. In fact, it turned out to be a group of five. There were three adults and two juveniles travelling together. I looked through the whole flock twice and found four more adults, making a total of nine Tundra Swans mixed in with 50 Trumpeters. There are many subtle features involving the bill that can be used to the separate the two species. If you're interested in learning more about distinguishing these two species, please check out this swan identification article by David Sibley from his blog. I spent a fair amount of time scanning through the ducks after sifting through the swans and was tickled to hear the Tundras making their higher-pitched honks for several minutes. It was a perfect encounter! I estimated there were more than 2500 waterfowl out on Tod Creek Flats, and you can see the breakdown of that from my eBird checklist here. I thought I heard Greater White-fronted Geese (Anser albifrons) when I first arrived and eventually tracked one down. As you may have seen from the checklist, it turned out there was actually a flock of 14 that I was able to observe after they flushed, circled the flats a couple times, then settled back on the water. I was also pleased to pick out three male Eurasian Wigeons (Anas penelope) amongst the American Wigeons (Anas americana). I went to Viaduct Flats next as there had already been one report of Redheads this fall from Duncan and Viaduct was the location I last saw them in Victoria. These hunches occasionally work out and this was one of those times. In with the mix of diving and dabbling ducks were three Redheads and ten Canvasbacks! I had hour-long birding sessions at Hastings Flats and Tower Point afterwards and just saw a nice variety of the usual suspects. The only bird I don't encounter all too often that I came across was a male Red-breasted Sapsucker near the parking lot at Tower Point. I ended the day with 78 species, which was a little surprising considering I wasn't specifically trying to amass a high species total for the day. I think a big day could easily churn out over 100 species right now. I do believe a certain Victoria birder with a blog about unsuccessful big years was prodding me to do a November big day. Maybe that's on the horizon?